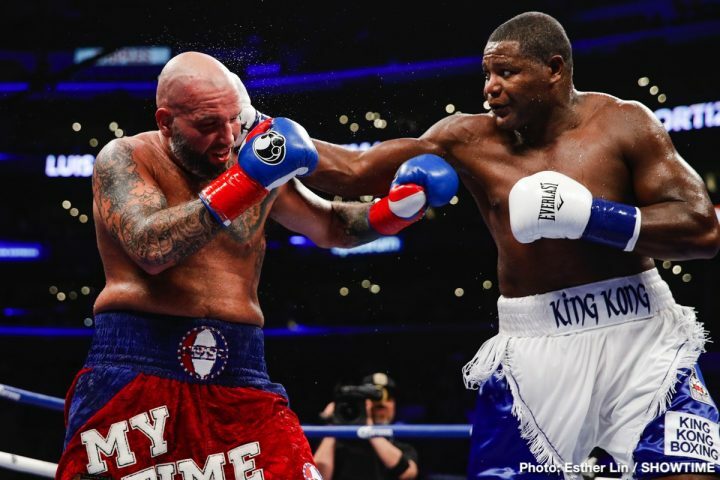 By Allan Fox: Former heavyweight world title challenger Luis ‘King Kong’ Ortiz (30-1, 29 KOs) won his 30th fight in defeating a very negative 33-year-old Travis Kauffman (32-3, 23 KOs) by a 10th round knockout on Saturday night on Showtime pay-per-view at the Staples Center in Los Angeles, California. Looking very skilled, the talented Cuban ‘King Kong’ Ortiz dropped Kauffman in rounds 6, 8 and 10. The fight was halted at 1:58 of round 10. Ortiz landed 135 of 575 punches for a 23 percent connect percentage. Kauffman connected on just 37 of 222 shots for a lowly 16% connect percentage. The fight would have been a lot more interesting for the boxing fans to watch if Kauffman didn’t spend most of the contest running from Ortiz. In round 10, the southpaw Ortiz hurt Kauffman with a left to the head that put him down. 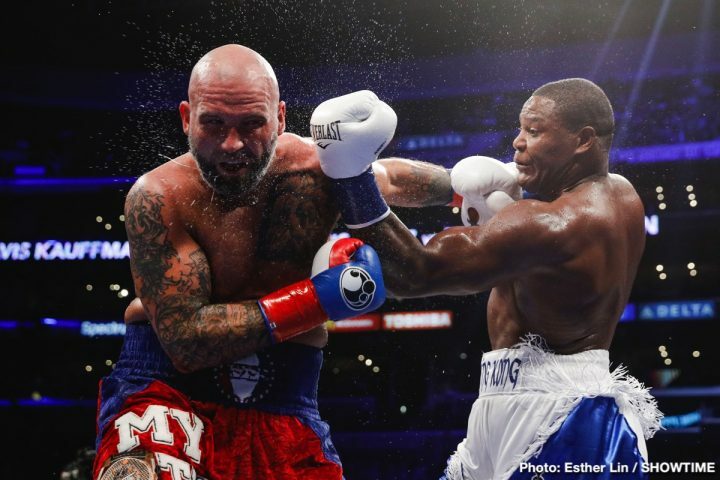 Ortiz then nailed the hurt Kauffman with a storm of well-placed shots until the referee Thomas Taylor stepped in to stop the fight. 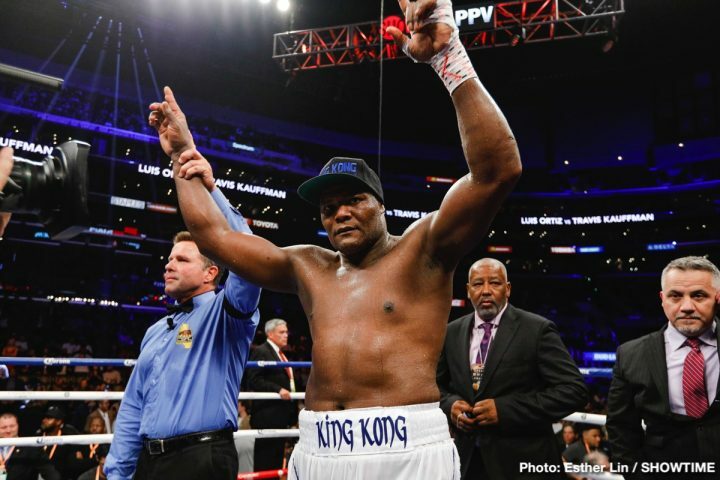 The win for Ortiz was his second consecutive since his 10th round knockout defeat at the hands of WBC heavyweight champion Deontay Wilder earlier this year in March. 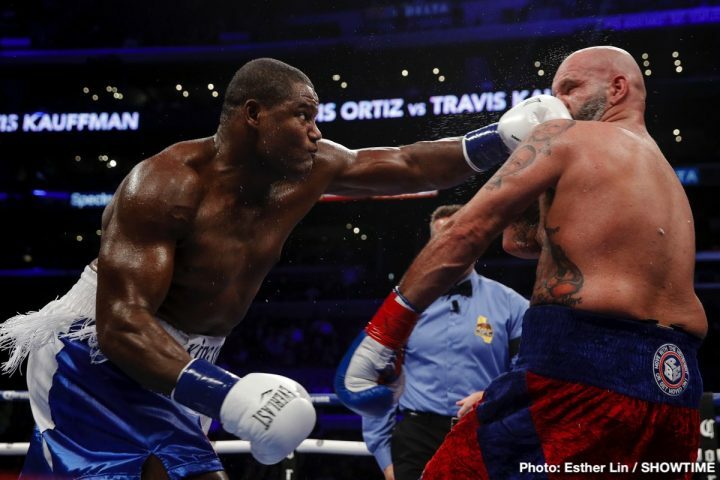 Ortiz knocked out former heavyweight world title challenger Razvan Cojanu in the 2nd round last July at the Staples Center. The boxing fans at ringside periodically booed the slow pace of the Ortiz-Kauffman fight tonight. The reason for that is Kauffman was just running around the ring, treating the fight like it was an exhibition match for him to survive to the final bell. Ortiz didn’t help matters by fighting at a slow place, and not going for the knockout early on when it was clear that he could have knocked Kauffman out with some sustained effort on his part. But it’s hard to know what was going through the mind of the 39-year-old Ortiz. He might have wanted to get some rounds in in order to get some practice. The way that Ortiz stayed in 1st gear through most of the fight would lead credence that he was just trying to get rounds in. Ortiz shifted his offense into 2nd gear in the 10th round, when he knocked Kauffman down with a hard left hand. Ortiz looked like he was trying to finish Kauffman off at that point in the fight. 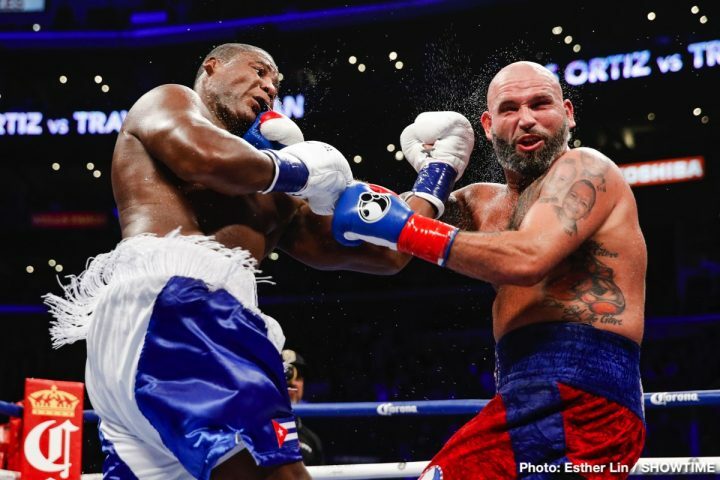 The referee could have let the fight continue for a little while longer after Kauffman got up from the 10th round knockdown, but Ortiz was going to stop him anyway if the fight had been allowed to continue. 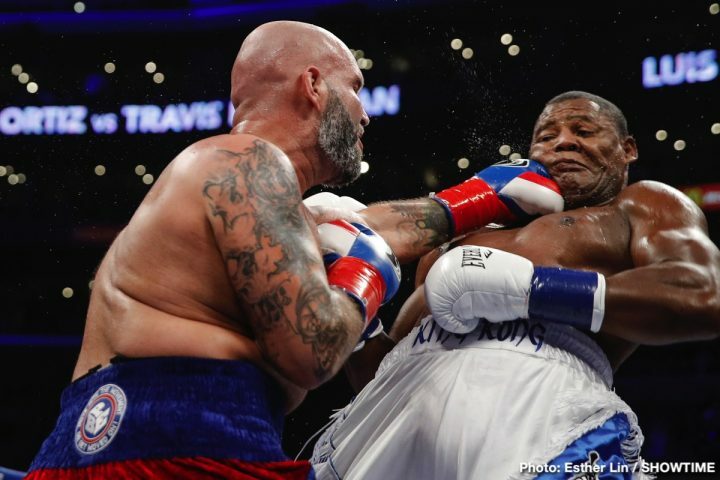 Ortiz was really hammering the hapless Kauffman, who at that point in the fight could no longer run from him and was reduced to being a punching bag. As bad as Kauffman looked tonight, it was hard to view him as deserving of a fight against Ortiz. There was a lot to like in Ortiz’s performance. His punching power with his left hand was top notch, and his jabbing was excellent. Ortiz did a good job of cutting off the ring to force the reluctant Kauffman to fight him. Ortiz didn’t have much to work with in this fight in dealing with a guy that didn’t want to be there tonight. Ortiz would like to fight the winner of tonight’s Deontay Wilder vs. Tyson Fury fight. Wilder, 32, would prefer to fight Anthony Joshua next if he gets past Fury, but that’s a Christmas wish that may not come true for the Alabama native. Joshua’s promoter Eddie Hearn has Dillian Whyte as the go to option for AJ to fight unless Wilder accepts whatever offer that is given to him by the British promoter. Wilder will need to forget about the 50-50 percentage split that he’s been asking for to fight Joshua. Hearn is talking anywhere from 80-20 to 60-40 in favor of Joshua for the Wilder fight.